YLE Radio Finland appears to have been the first European international broadcaster to open an 800-line (toll free) in the US, and later in Canada. Done in the very early 80s the move had an expensive look, though the cost actually was not that high. The calls never reached Finland, but an answering system at the office of John Berky, the YLE Radio Finland audience and distribution representative in North America. Based near Hartford, CT, Mr Berky pursued his main career in US public radio. He had been recruited by YLE originally in 1973 to handle distribution of YLE classical music and transcription tapes. In the transcription service YLE English programmes were made available to local stations in the US. When YLE Radio Finland started creating a local audience service presence in North America Mr Berky was a rational choice. The requests for schedules were serviced on location in North America. Comments reached Finland on cassettes. 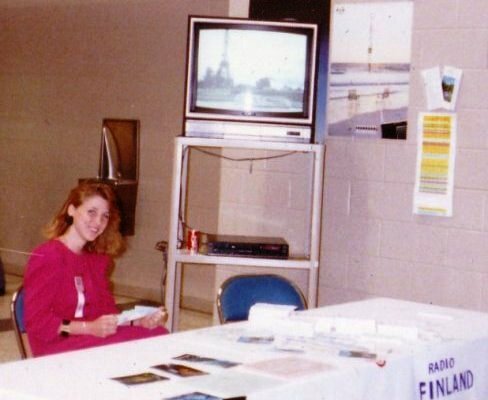 From 1989 until 2002 Radio Finland appeared in the annual FinnFest events arranged on various locations in the US. 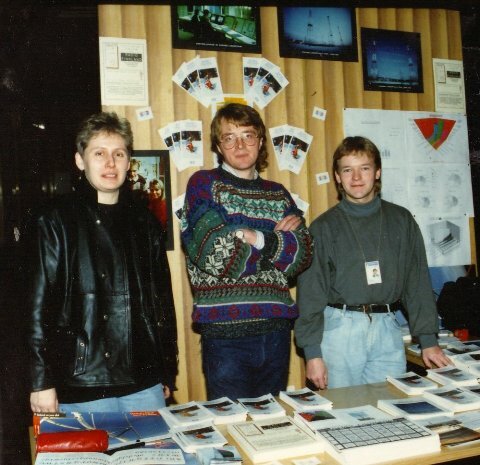 Mr Berky usually arranged the logistics for the displays Seen here (left) during an event in Minot, North Danota, with journalist Kimmo Wilska and secretary Pirjo Usenius. Broadcaster Teri Schultz in an event at Norfolk, VA, in September 1991. 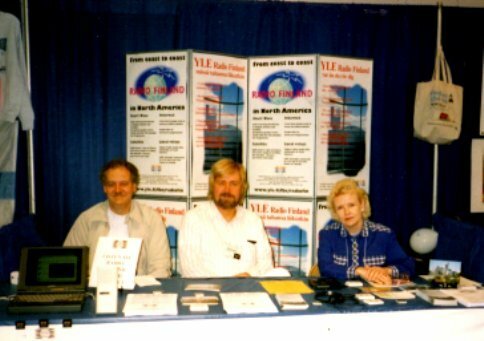 This was a general short wave listeners fair, attended by several European broadcasters. The screen and VHS kept repeating an eight minute promotional video produced in 1988, with versions both in English and German. This photo was used for pr at the time. There was a version there were people in abundance in front of the table. As permissions to appear in publicity was not asked, that was not published. The German language service (relaunched in 1985) pioneered events arranged abroad, connected often with activities arranged by Finnish expatriates in Germany or events such as the Berliner Funkaustellung. This picture is from Hamburg, in late 1990. Seen from the left broadcaster Christiane Winkelman, broadcaster Rasso Knoller and producer Dieter Krause. 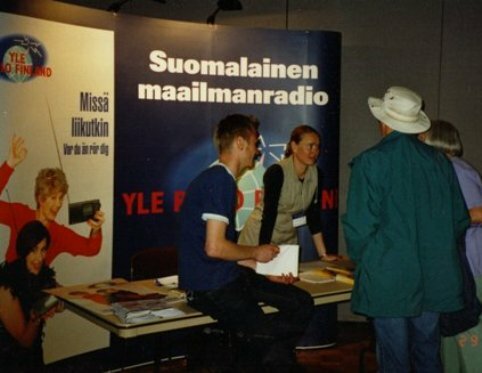 One of the last events participated by Radio Finland in North America was the Finnish Canadian Convention of 2002 in Calgary (Alberta). The background display reflected the campaign directed towards Finnish tourists and expatriates, about the world band radio as a cost saving alternative to a mobile internet gadget. At the time of the Calgar event word was already out that the foreign language services would close and Radio Finland focussed on Finnish and Swedish. - Seen here talking to listeners technical coordinator Janne Nieminen and journalist Salme Unkuri. Radio Finland appeared also in events in Australia. From 1999 regional caucus meetings of the Finnish Expatriate Parliament were taped and broadcast later on Radio Finland in Finnish. Simon Spanswick from the UK started arranging pr and publicity services for the international broadcasting scene in the early 90s. The service later developed into the Association of International Broadcasting. YLE Radio Finland was never a member. 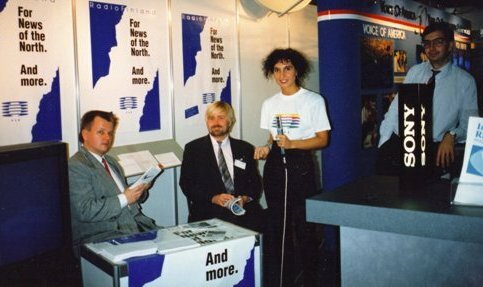 We attended some early joint publicity ventures though, including this (below) in Geneva during a Telecom Fair there. From the right, Simon Spanswick, Caroline Gasmi (YLE French), Kimmo Wilska (YLE English and German) and Juhani Niinistö.